Recursion is an important topic in computing as it provides a simple yet elegant way of implementing complex solutions. 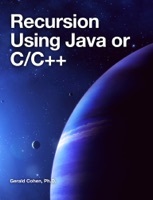 An explanation of how recursion works is provided, together with a number of problems and their recursive solutions - using Java. Most, if not all are the same in C/C++ or, at the very least, require minor modification. Every problem presented demonstrates how to recognize a recursive solution - even in those cases where it is not apparent.